Screen shot of my interview on KelownaNow. 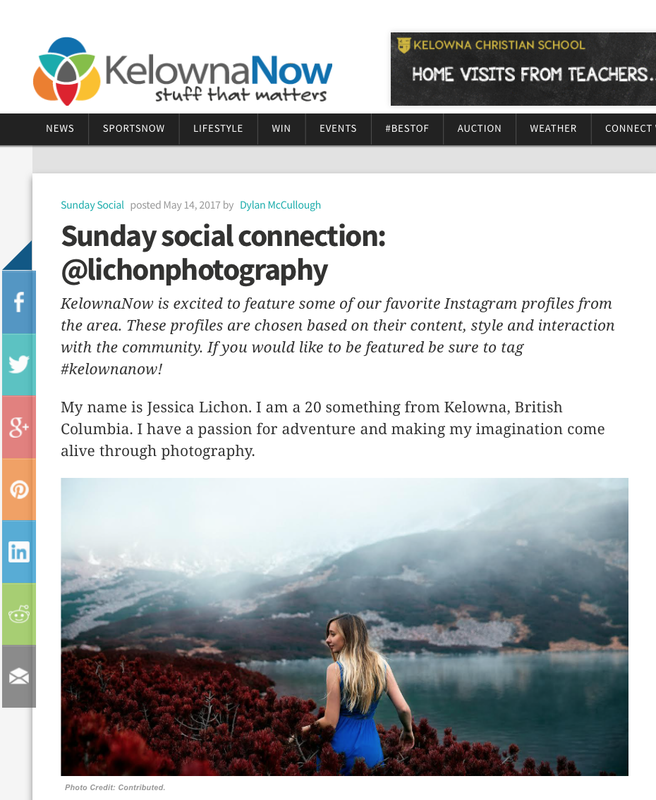 I was thrilled when I received an email from KelownaNow asking for an interview about my Instagram account @lichonphotography for their Sunday Social Connection. The Sunday Social Connection interviews social media accounts from Kelowna British Columbia, Canada. The profiles are chosen based on their content, style, and interactions with the community. The interview questions gave me time to reflect on my interactions with Instagram. Thinking about creating a blog post about this interview was tendious.Should I screenshot the interview? Re-post the interview word for word? Or should I talk about my insights from the interview?I chose the later because I want to direct traffic to my interview on KelownaNow! The interview got me thinking about why @lichonphotography account is more successful then my other instagram account @kelownaweddingphotographer. Why have Different Instagram Accounts? I have two photography accounts on Instagram. I chose to create two different Instagram accounts because my target audiences are different. My @lichonphotography account is for fine-art enthusiast . Whereas, @kelownaweddingphotographer is targeted towards potential lifestyle clients. Similarly, my website is marketed towards potential wedding clients. This explains why you don't see my fine-art photographs on my website. Consistency on Instagram is very important. When you scroll through someones feed you should instantly understand the content they're creating. Usually an underlying theme is easily identified by the viewer. My feed would look sloppy if I mixed my fine-art and lifestyle photography together. Looking through @lichonphotography you can easily identify a fantasy orientated feed. Whereas, @kelownaweddingphotographer overarching feed theme is lifestyle photography. Funny enough, I don't think the @kelownaweddingphotographer account is consistent; which reflects my lack of motivation to update my feed. Even my Instagram name does not reflect the content on my feed. I chose @kelownaweddingphotographer in hopes to boost my SEO online (my name appears on googles search engine). Perhaps, I should call my lifestyle account @lichonlifestyle rather than @kelownaweddingphotographer. I have to give this some more thought. Why do I neglect my Wedding Photography Instagram Account? The interview with KelownaNow was about my fine art account because I am constantly engaging with the fine-art photography community on Instagram. I am always giving people genuine likes and comments on other accounts. The last year on average I post once a week on @lichonphotography. I upload videos everyday on my stories. On average 100-250 people view my stories daily. Giving my fans the behind the scenes look into my everyday life. My posts on average do fairly well with less effort, making my usage more rewarding. Whereas, @kelownaweddingphotographer is not nearly as rewarding. I don't have as many followers following my posts on the account. I don't engage with the wedding community on Instagram daily, I don't upload any stories, I don't put any work on the account, and I've never had anyone inquire for my wedding services through Instagram. All my inquires for weddings come through my website. Perhaps with more effort, I can make the wedding account more engaging and hopefully get another interview but with the focus on my wedding photography!